The All India Kisan Sabha (AIKS), backed by the CPI(M), announced suspension of the 180-km march from Nashik to Mumbai after a three-and-a-half hour meeting of its representatives with state ministers Girish Mahajan and Jaykumar Rawal. A leading farmers’ organisation on Thursday announced suspension of its ongoing protest march from Nashik to Mumbai over agrarian concerns after talks with the Maharashtra government. The farmers had embarked on the march on Thursday morning, but it was called off later. “The meeting (held Thursday) yielded positive results. We will suspend the march today,” AIKS president Ashok Dhawale told PTI after the meeting between the two sides at Ambebahula village in Nashik. This is the second time in the last one year that farmers were on the roads to protest against the “betrayal” of peasants by the BJP governments at the Centre and in the state. Earlier, they had planned to launch the march on Wednesday but it was deferred by a day allegedly after the state police stopped scores of farmers approaching Nashik from districts like Thane, Palghar and Ahmednagar. In a late night meeting on Wednesday, the AIKS had asked the government to give its assurances in writing, a demand Mahajan agreed to. Mahajan had held parleys on behalf of the Devendra Fadnavis dispensation. The AIKS, however, had decided to proceed with its march from Nashik till the government kept its word. Accordingly, the third round of meeting was held Thursday. AIKS representatives had held the first meeting with the government on February 17 ahead of the launch of the long march. 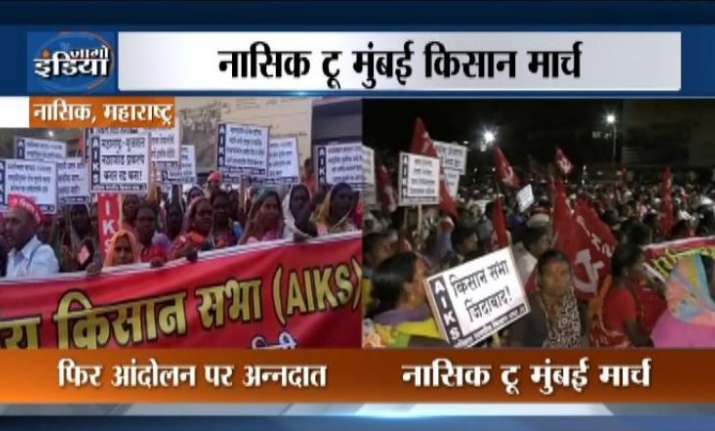 According to AIKS president Dhawale, around 50,000 farmers from Nashik, Thane, Palghar, Ahmednagar and other districts of Maharashtra had taken part in the march. Dhawale said the farmers will again launch the protest in case the government failed to keep promises made in writing. The meeting was also attended by CPI(M) MLA J P Gavit.Dhawale said the government has given in writing that the ministers and AIKS representatives will take stock of the implementation of assurances every two months. “Such meetings did not happen over the past year. Now, they have given it in writing that these meetings will be held to review progress of implementation,” Dhawale added. Besides accepting the demands raised by the farmers, the AIKS said the government has assured that water flowing in Maharashtra’s rivers like Nar, Par, Damanganga and Pinjal will be transferred to the Godavari basin through lift irrigation and used in drought-hit areas of the state. “The meeting went for three-and-a-half hour. The concerns raised by the AIKS representatives were conveyed to the chief minister. “The meeting was positive. I am sure the AIKS representatives are satisfied,” Mahajan said. Following the suspension of the agitation, farmers left for their respective native villages, the AIKS said.